A pair of siblings will provide an up-close look at Palestinian daily life and culture in a free talk at St. Scholastica. 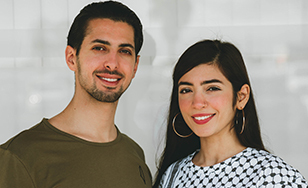 The Alworth Center for the Study of Peace and Justice Lecture Series presents "Celebrating the Culture of Palestine" with brother and sister Hussein and Aminah Musa at 7:30 p.m. Tuesday, April 9 in the Somers Hall main lounge on campus. The Musas have a deep connection to Palestine and have recently returned from a trip there to visit family and friends. They are the founders of PaliRoots, an American clothing company that promotes Palestinian culture. They donate 10 percent of their profits to Palestinian charities. For more information, visit spotlight.css.edu or contact the box office at spotlight@css.edu or 723-7000. The theme of the 2018-19 Alworth Center for the Study of Peace and Justice lecture series is "Unraveling the Israeli-Palestinian Conflict," focusing on the current state of the Middle East and America's involvement in the region.